In a few days time myself and a few thousand other people will be preparing to dance up a four day long storm at the Rocking The Daisies 10th anniversary event! Here are a few outfit and accessory ideas for all the ladies needing to pack.. These outfit options will keep you looking and feeling cool. 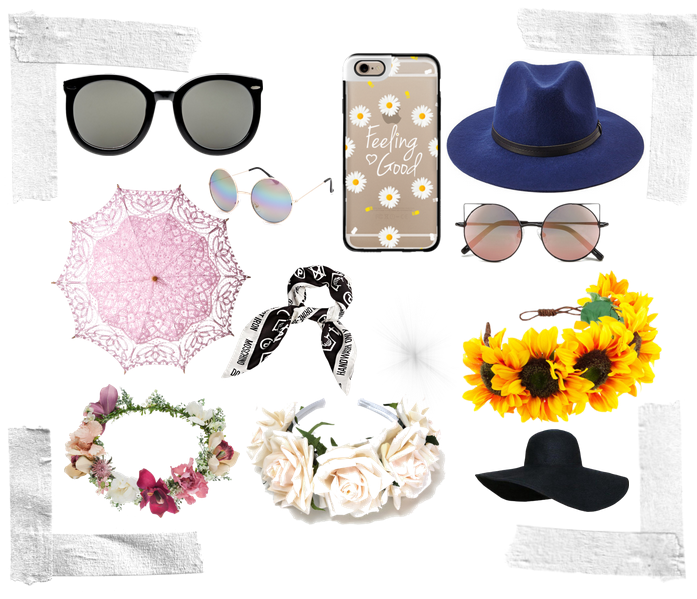 The most cliche but still completely on trend accessory; the floral headband. They are available in every single colour under the sun, in almost every single flower type. I would generally NOT wear one of these out and about but at Daisies, these are as common as high waisted shorts in Summer. Sunglasses. DO NOT FORGET THEM. Every year, without fail, the sun is blisteringly hot and I’m sure you actually want to be able to see the artists on stage? Correlating with the above point; hats, headbands and umbrellas. Quite simply, anything and everything that can keep your lovely face protected from the sun. As a girl who hardly ever steps out of her leggings and dresses for fear of my white pins blinding people, this is the one time when you have to grit your teeth and do it. 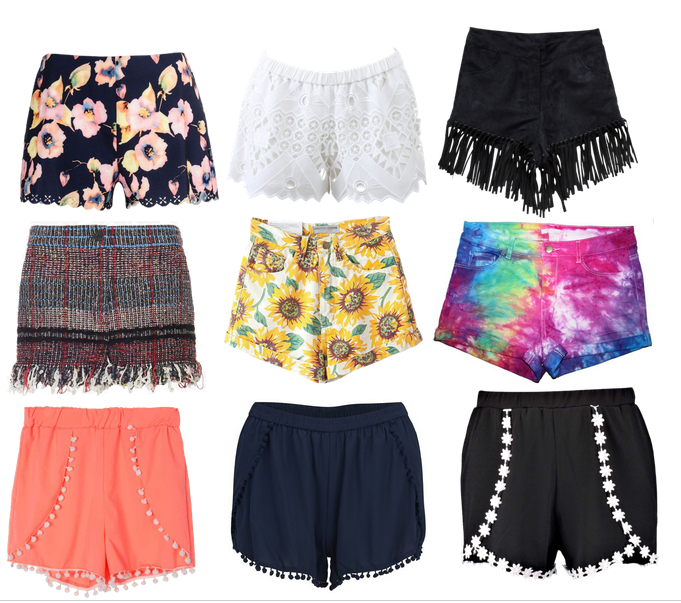 Flowy and soft shorts are just the thing for festivals. The weather forecast is not actually looking too fantastic but you should definitely be packing shorts over jeans and leggings. I have taken inspiration from Polyvore so unfortunately these AWESOME styles above are not available here but I have seen some very similar designs at Mr Price and Forever New. Definitely give those stores a look. Now for the BEST part; make-up! The worst part about Rocking The Daisies is the non-access to proper hot running water and baths. Obviously you can pay for the upgraded package which includes hot showers and MIRRORS! But for the most part, you will be applying any make-up using your car mirrors. And some cars don’t even have passenger mirrors.. The easiest way to get away with looking good in this sort of environment is by using tricks. Wear that colourful nail polish that you sometimes think is too bright. Wear those crazy neon eyeshadows that you bought but never got around to using for fear of getting stared at. At Rocking The Daisies ANYTHING goes. DO NOT forget loads of lipbalm and body lotions to keep you hydrated and not feeling super dry. Especially do not forget your sunblock. As I said above, the weather is not looking too great but ten hours straight in medium to warm weather will still have an awful effect on your body if you do not protect it. 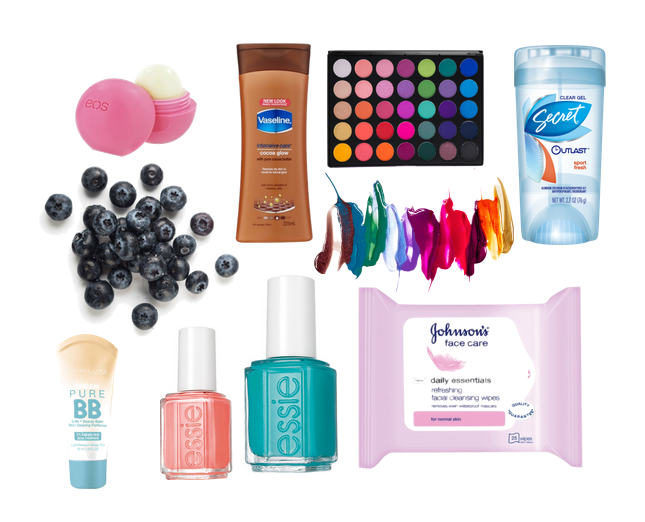 Loads of roll on and face and body wet wipes are also a must as you never know what state the “bathrooms” may be in….